In 1936 Edward VIII became King of England upon the death of his father. Before his coronation could take place, however, he abdicated the throne to marry Wallis Simpson. His younger brother,George VI (father of the present Queen Elizabeth) was crowned in his place. 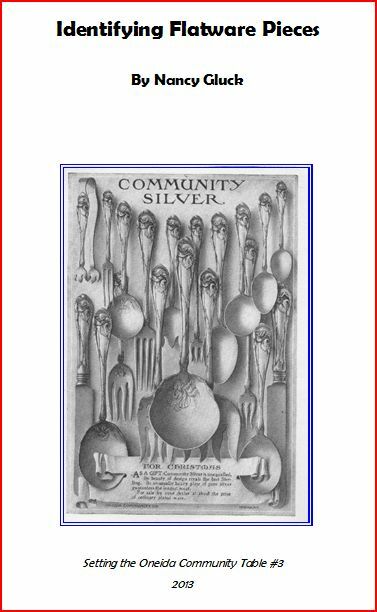 In the same year, Oneida introduced a pattern named Coronation in its line of Community silverplate. This same pattern was marketed in the United Kingdom and the Commonwealth as Hampton Court. 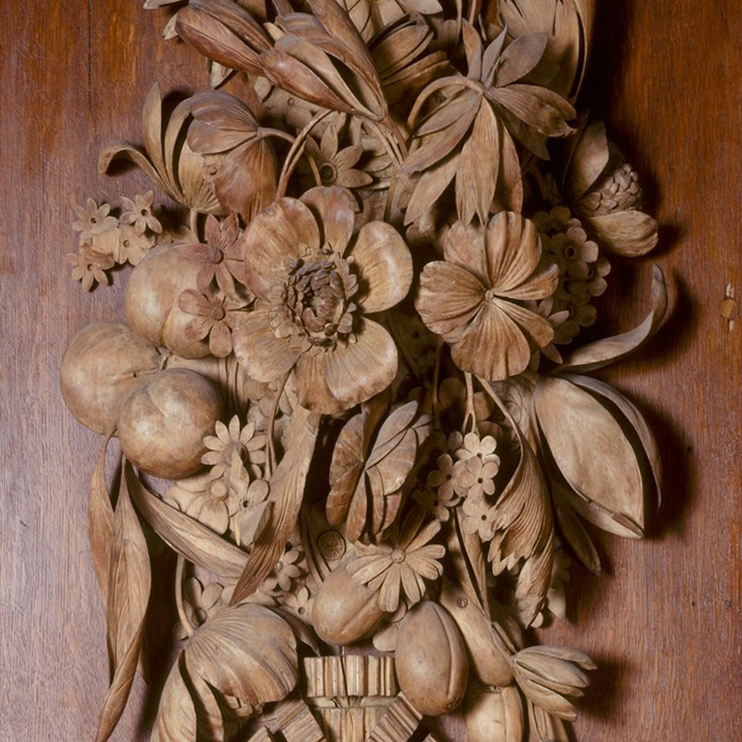 was inspired by the carvings of Grinling Gibbons at Hampton Court. My Internet-available American Silver Booklets document Coronation, as well as a number of other popular patterns such as Grosvenor and Lady Hamilton. All booklets are free and can be read on-line or downloaded. Click here to see a complete listing with links. Additional detailed information is also available at a Coronation Pattern Flatware Page on the Internet. 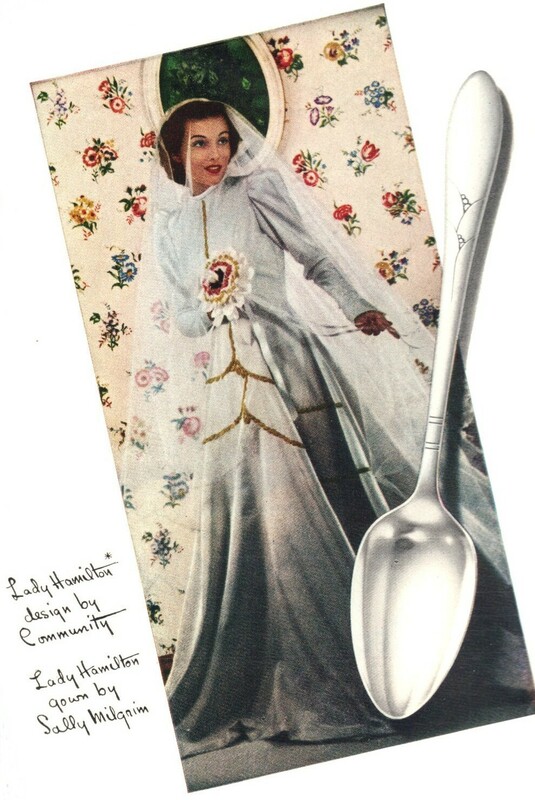 If you want your wedding dress to match your silver pattern, you could do that in 1932 when Oneida introduced the Lady Hamilton pattern in silverplated flatware. 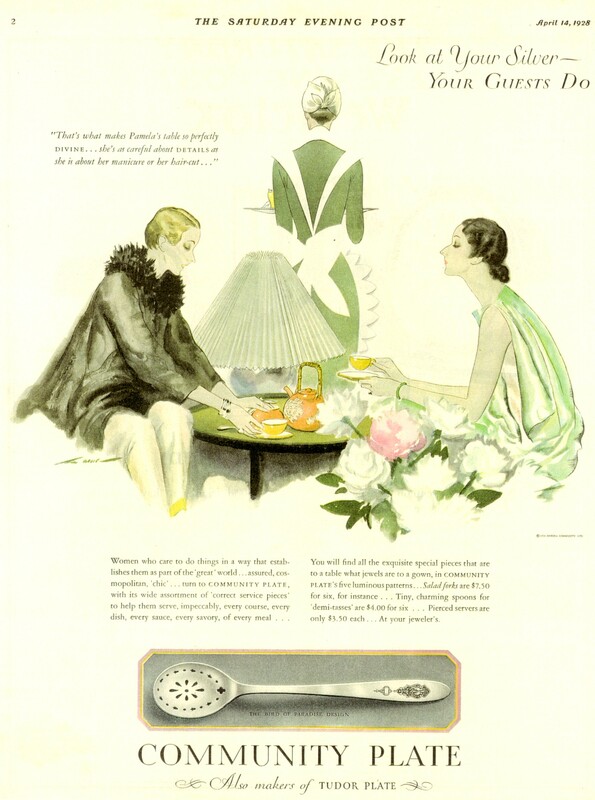 This modernist design continued to be popular right up to the time of American entry into World War II, when Oneida stopped manufacturing flatware, but continued to advertise the pattern. 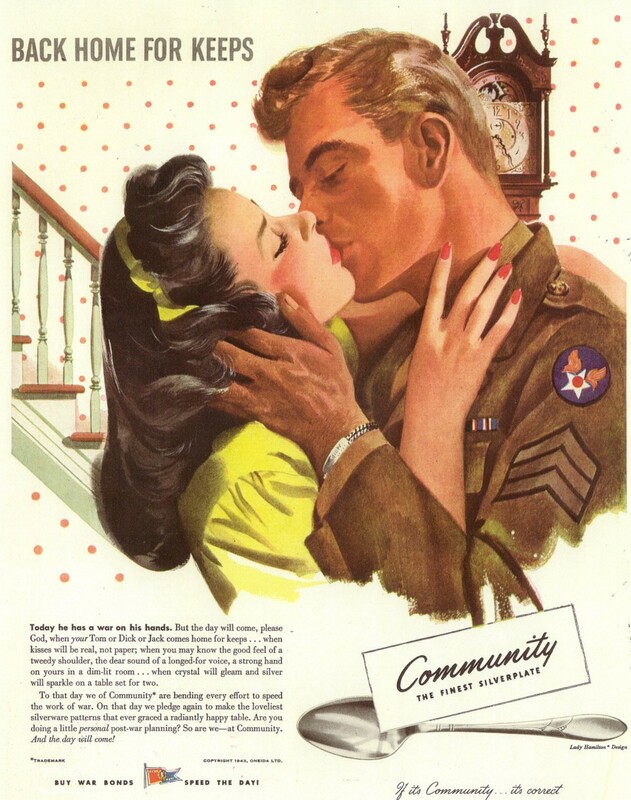 After the war they marketed it again until the 1950s. The results of my research into Oneida Community patterns and products appear in my book The Community Table, self-published in 2004. That book is now out of print. I am replacing it with my American Silver Booklets, available to all, free. Click here to see and read available books on the history of Oneida and such popular patterns as Grosvenor and Deauville. 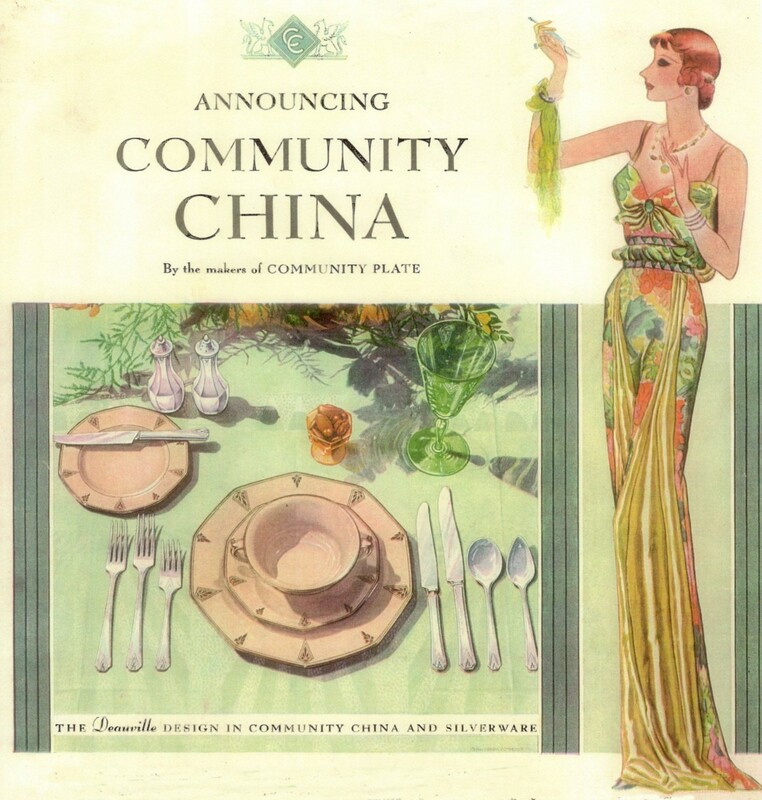 In the 1929 Deauville pattern Oneida Community offered silverplated flatware and hollowware, as well as china and crystal designed to match the art deco pattern. 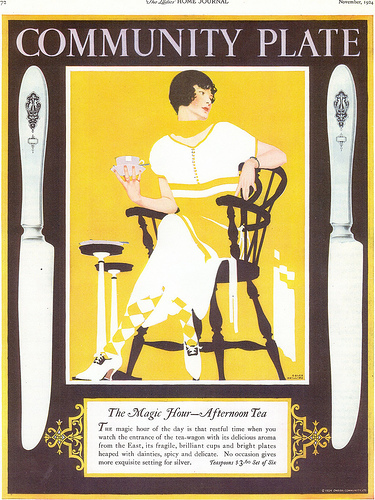 Advertisements featured attractive women with hairstyles and clothes fashionable at the time. 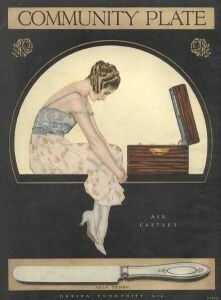 Advertisement for the 1930 Noblesse pattern, also in the Art Deco style, woman included. You won’t find much American silver with designs in the art deco style. It is style that conveys energy and modernity; it does not appeal to the traditionalist or the romantic. 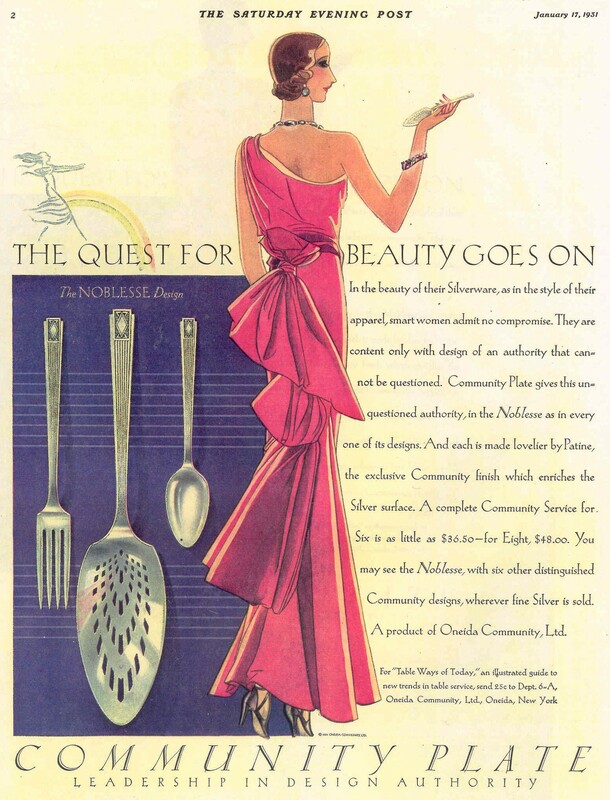 One American silver company, Oneida, did introduce some art deco patterns in silverplated flatware. Two in the Community line — Deauville and Noblesse — were documented in my book The Community Table. I have now converted the information about the patterns into digital form as part of my American Silver Booklets series. I have added more pictures, many in color. All information is free and can be downloaded. Click on American Silver Booklets to see the list of those available now. 1920s ad with snob appeal. I have prepared a new American Silver Booklet. This one illustrates the 1923 Bird of Paradise pattern by Oneida Community and lists all the flatware and hollowware pieces offered in the pattern. Booklets offer general information about the history of Oneida, its marketing techniques, and identifying flatware pieces. The Adam 1917, Grosvenor 1921 and Bird of Paradise 1923 have now been documented. You can see a list of all the booklets currently available at American Silver Booklets. This information is free. You can read it on the screen or print it out. You can also save it to your own computer and share it with others. Always credit the source. Do not use it for commercial purposes. If there is an Ice Cream Fork is there also an Ice Cream Spoon? How can I tell whether this is really a Punch Ladle? Who knows the difference between a Luncheon Fork and a Dinner Fork — or Medium Fork, or Salad Fork, or Pastry Fork, or Fish Fork? The American Silver Booklet Identifying Flatware Pieces answers these questions. Piece-by-piece you examine the flatware used to serve and eat the meal. 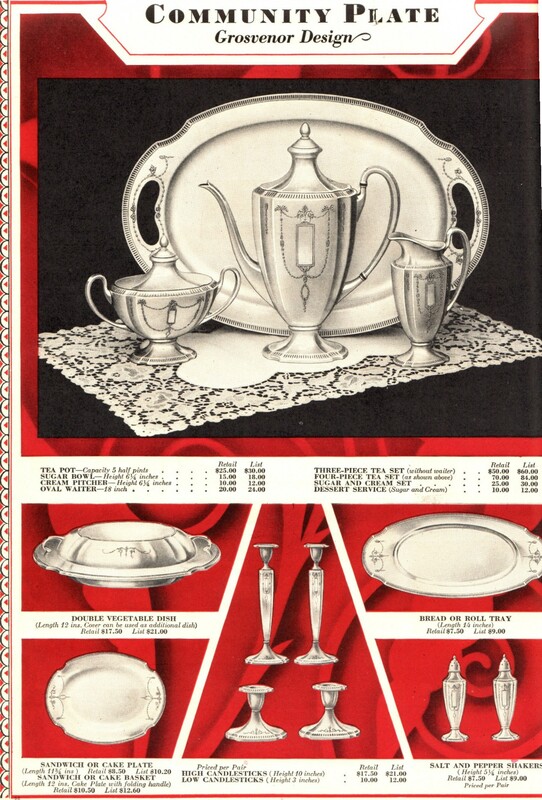 Most pieces are illustrated, using images from the catalogs of Oneida Community Ltd. and the International Silver Company. In addition, a comprehensive index of Flatware Names and Measurements lists all the pieces described, with alternate names and usual measurements. All this information is free. Click on Identifying Flatware Pieces to download it, read it on screen, or print it out. Please share the information with others, but do not sell it or use it for commercial purposes. For a full listing of all booklets available and planned, click on American Silver Booklets. 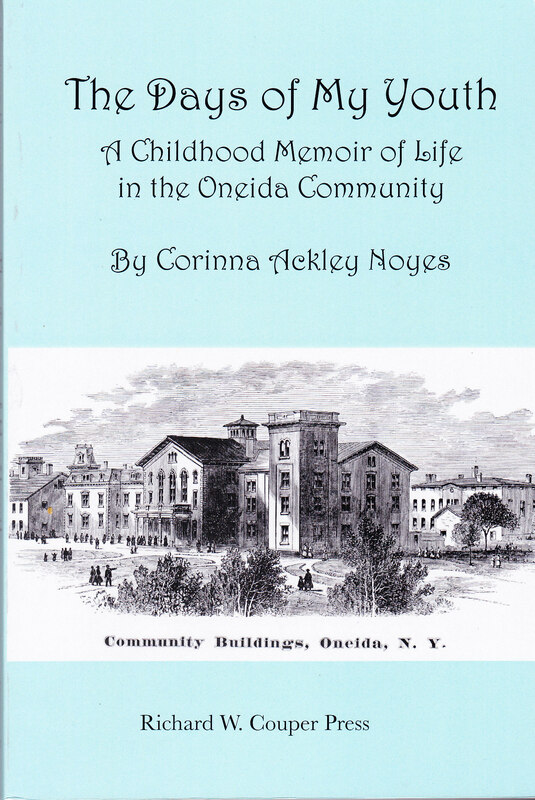 I have been reading The Days of My Youth: A Childhood Memoir of Life in the Oneida Community by Corinna Ackley Noyes. Corinna’s grandparents and parents were early members of the utopian community of Perfectionists at Oneida, New York, founded by John Humphrey Noyes in the 1840s. She was born there and lived there as a “child of the community” until its breakup in 1880. She went on to marry Pierrepont Noyes, one of the sons of the founder. Pierrepont Noyes led Oneida Community Ltd., the corporation formed when the utopian experiment ended, to a successful place in America’s 19th and early 20th century silver industry. “Oh,” I said,” It’s too pretty to eat. This was not at all the general sentiment, and my remark was met by silence and sour looks. Then a bright thought struck one of the children. “Couldn’t we just lick the back of it? It wouldn’t hurt it.” Our moths were all watering by that time and it seemed quite feasible, so I unwrapped my rose and passed it around, dire apprehension in my hear. Those licks were long and loving but by the time it reached me I couldn’t see that the lovely rose has suffered. It was just as pink and perfect as when I got it, so I dared to take my turn at licking…. Memories of another visit to Wallingford explain what is shown on an early 20th century postcard above. Malaria, which followed the enlarging of the pond to provide water power for the spoon factory, as it was called, had taken a heavy toll of the Wallingford family…. The spoon business was to be moved to Niagara Falls and the Wallingford factory was sold to Maltby, Stevens & Curtis of Meriden, Conn. 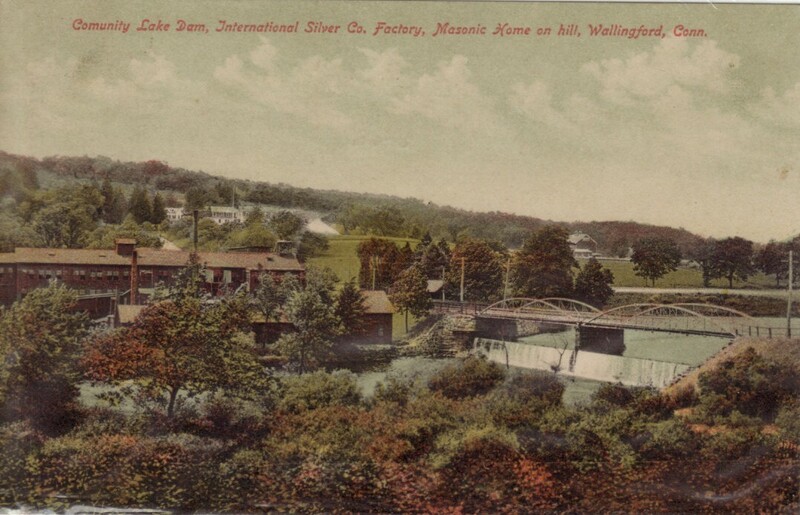 The postcard bears the inscription “Community Lake Dam, International Silver Co. Factory, Masonic Home on hill, Wallingford, Conn.” Maltby, Stevens as acquired and became part of International Silver at the time of the big merger in 1898, so when the postcard was made the factory building shown on the left had become part of International Silver. The lake was known as Community Lake then and still is. The original dam is gone, replaced by an earthen dike. The road, Hall Avenue, is in the same location, but the waterfall is gone. International Silver is also gone, and the building is currently being used by Amphenol Corporation. 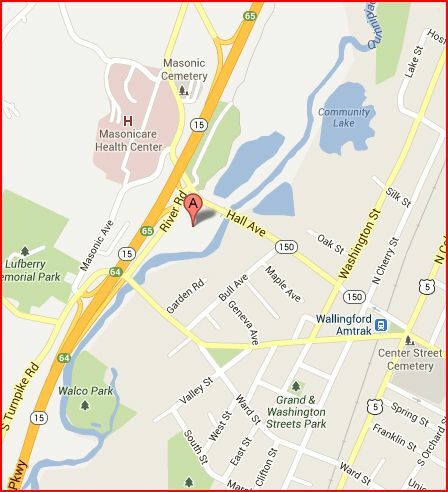 A map of the Wallingford location shows the relationship of the building (A) and the somewhat-altered lake. It only remains for me to tell of the final end of the Wallingford Community buildings. They were large enough to accommodate a family of fifty, by no means beautiful and not easy to sell advantageously…. Not until two years later was a satisfactory offer made. This came from the Freemasons who wanted it for a home for their aged members. They would also have use for the farm, so it was sold to them and is still used by them [in 1960] for this purpose, thus maintaining its original purpose – a communal home. The retirement facility for the Masons is still in Wallingford, but is now west of its original location, which is now occupied by their health center. 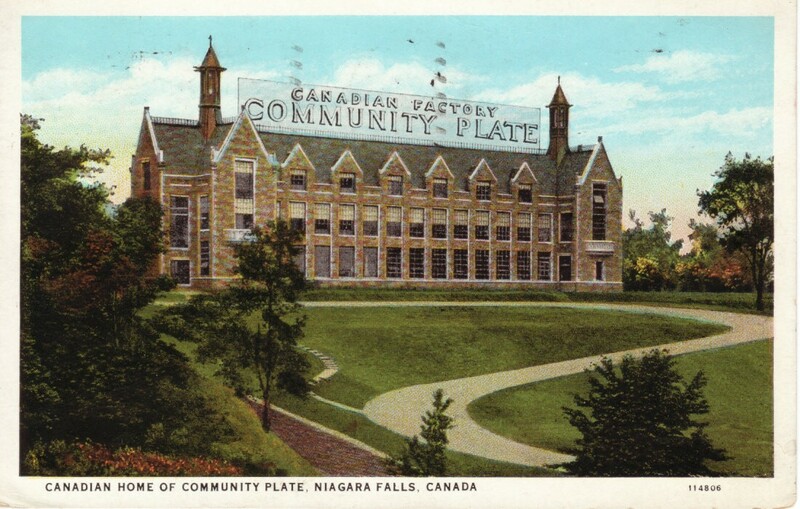 Corinna’s memoir has, incidentally, explained the appearance of another postcard: the factory in Niagara Falls, Canada. As you can see the building has a sign “Canadian Factory / Community Plate,” but I had a hard time accepting that this was a factory building. Surely, this is the executive office and “the works” are out in back. Not so. That factory, built in 1925, looks more like a college building than a commercial plant. To me it is a joy to behold, on its terraced hill surrounded by flowering shrubs and gardens with the breath-taking grandeur of the falls always in view, a place for inspiration, a place to dream dreams. When I visited the Shaker village in Kentucky, our guide pointed out that the workshops were as well constructed, as airy and well-lighted and pleasant as the living quarters. Work is honored with “A place to dream dreams.” Today we are short on such dreams, but the descendants of the Perfectionists understood our need for them. For more about the Oneida Community, its history and products, click here. 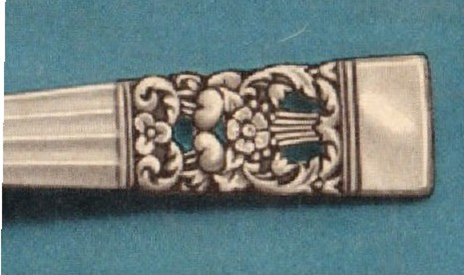 The Grosvenor pattern, introduced in 1921 by Oneida in its Community line of high-quality silverplate, has been one of its long-time best sellers. The Adamesque pattern complemented the Colonial Revival architecture and furnishing in fashion at that time. Grosvenor is also notable for being a pattern in which you can find matching hollowware, as well as china and crystal. Click on American Silver Booklets for links to all available digital booklets. You can read them on the screen, print them out, save to your own computer, and share them with others. Always credit the source. Do not use them for commercial purposes.